Leather Cords 1.5mm flat, metallic color - golden. 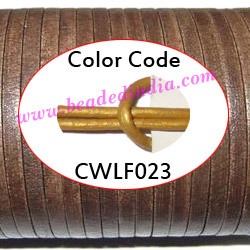 supper quality 1.5mm flat leather cords, metallic color - golden as per the photograph, spool pack of 100 meters. Also available in 50 meter spool pack, 25 meter spool pack and 1 meter pieces without any extra cost. Silver Plated Fancy Beads, size: 7.5x14mm, weight: 3.87 grams. Sterling Silver .925 Headpin, size: 1.5 inch (38 mm), head size : 4mm, weight: 0.21 grams.